35. One year after transferring its Consulate for eastern Ukraine to Kharkiv from Dnipropetrovsk, the Government of Israel re-opened the Dnipropetrovsk consulate and its attached Israel Cultural Center in office space within the Menorah Center. Among other responsibilities, the Consulate provides Israeli entry visas to new immigrants, a major convenience that eliminates the necessity of travel to consulates in Kyiv or Kharkiv for such documents. Although the official consul resides in Kyiv and is in Dnipropetrovsk only one week each month, local activist Jews and Jewish organizations seemed greatly relieved that an official representation of the State of Israel is once again present in their city. The major function of the Israel Cultural Center, said an ICC professional, is to "bring Israel to all people, not just Jews, in the area." It is important that Ukrainians be exposed to Israel culture, education, and other fields, including medicine and technology. The ICC organizes "Israel Days" in local universities, offering presentations by Israeli specialists in computer science, other high tech fields, and even Hebrew literature. Local universities are eager for such events, said the professional, although current political tension generated by Russian activity in Ukraine has rendered some higher education institutions unable to plan ahead for them. Additionally, continued the professional, the government of Israel sponsors events showcasing Israeli culture, including Israeli film festivals and tours of Israel musical and theater groups. They have sent Israeli chefs to local restaurants and other venues to demonstrate modern Israeli cooking and, thus, dispel beliefs that Jewish cooking must be heavy, dense, tasteless, and unhealthy. Representing Nativ, an Israeli government entity outside the Ministry of Foreign Affairs, that deals with Russian-speaking Jewry, the Israel Culture Center also offers its own ulpans and its own MASA programs. The ICC also created and manages a version of the Israeli Scout program, targeting youngsters whose families are uninvolved in any other Jewish endeavors. The Scout program enrolls 40 youngsters in Dnipropetrovsk and has additional groups in Krivoi Rog, Donetsk, and Melitopol. In August, said the ICC professional, Nativ would convene three four-day Scout camps in Ukraine, each enrolling 300 youngsters. Responding to a question about aliyah, the ICC professional stated that young families seeking better opportunities for their children constitute a major portion of local Jews moving to Israel. Another significant group consists of middle-age adults joining their adolescent or young adult children who have already made aliyah in the Na'aleh, Selah, or other programs for these age groups. Some older people, said the professional, go to Israel for medical care, although some in this age cohort also join family members already there. 36. The sister-city relationship between the Boston and Dnipropetrovsk Jewish communities, various details of which are noted elsewhere in this section, was initiated in 1992 and today is the most comprehensive of any “kehilla” project connecting North American and post-Soviet Jewish population centers. It involves both Jewish and non-sectarian entities in each city, although most of the latter appear to have been promoted by Boston-area Jews. The relationship also includes some projects involving Haifa, Boston’s partner city in Israel. The relationship is enabled by a number of different Jewish organizations in the Boston area, all of which are associated in some way with Combined Jewish Philanthropies (CJP) of Greater Boston, the local Jewish federation, and the Jewish Community Relations Council (JCRC), a CJP agency. As noted previously, Action for Post-Soviet Jewry, an independent organization, created and manages the Adopt-a-Bubbe program, and Jewish Big Brothers/Big Sisters of Greater Boston (a CJP agency) inspired and advises its Dnipropetrovsk counterpart, known as Older Brother, Older Sister. CJP, JCRC, and other Federation agencies related to Jewish education, employment services, and children's and elder care services all participate in this relationship. Additionally, various Boston physicians and medical institutions have played critically important roles in enhancing women's health programs and pediatric care in Dnipropetrovsk. Although some refer to the relationship as a “partnership,” almost all initiatives and funding originate in Boston. The major funding source is an allocation from CJP to JCRC; however, some programs - particularly Action for Post-Soviet Jewry - raise money separately. A Young Leadership group of CJP, in addition to CJP as a broader institution, also is involved. Unlike other relationships between North American Jewish federations and post-Soviet Jewish population centers, the Boston-Dnipropetrovsk relationship does not include collaborative projects with the Joint Distribution Committee (except for monthly teleconferences on special needs children), te Jewish Agency for Israel, or the Hillel student organization. Yan Sidelkovsky, who manages the relationship in Dnipropetrovsk, stated that several planned delegations from Boston had cancelled trips scheduled for March and April, reflecting anxiety about their safety in Ukraine. However, the chairman of the Boston Dnipropetrovsk kehilla project and a JCRC staff member visited in June and discussions are moving forward about significant Boston involvement in the new premises of the Jewish Medical Center in the Menorah building. Boston is providing very valuable consulting services regarding facility design and will assist the JMC in acquiring necessary medical apparatus and tech- nology. Additionally Boston physicians will organize continuing medical education for selected local doctors in an effort to upgrade local medical practice. 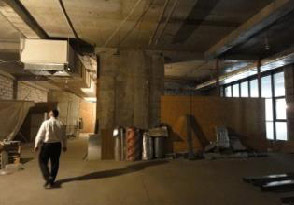 Shown at right is a section of the space in the Menorah Center in which the Jewish Medical Center will be located. Photo dates from June 2014. Photo: Ann Levin, Boston Chairperson of the Dnipropetrovsk Kehilla Project. Mr. Sidelkovsky continued that the new focus of Boston medical work is primary care, family medicine, and development of a Jewish community medical system. Previously, CJP had concentrated more on certain specialties, particularly women's health. The Boston effort also is directing more attention to special needs education, using the Special Needs Educational Resource Center as a base. 37. Responding to a request from the writer, Rabbi Shmuel Kaminezki arranged an appointment for her with Boris Filatov, Deputy Governor of Dnipropetrovsk oblast. Mr. Filatov reports directly to Ihor Kolomoisky, Governor and a major financial supporter of Ukrainian independence. Mr. Filatov underlined that the situation vis-a-vis Russia is fundamentally different in Dnipropetrovsk from that in Kharkiv to the north or either Donetsk or Luhansk to the south. Unlike Kharkiv/Donetsk/Luhansk, Dnipropetrovsk does not border on Russia; therefore, it is more difficult for Russia to infiltrate political agitators or harmful materiel into Dnipropetrovsk oblast. Further, he said, it is problematic for Russia to agitate in Dnipropetrovsk on a Russian nationalist platform because Dnipropetrovsk has long been tolerant of minority groups; historically, the oblast has been home to large Jewish, Armenian, and Azerbaizhani minorities so local people are accustomed to living among others of different backgrounds and do not respond well to suggestions that one group is superior to others. Governor Kolomoisky has determined four priorities for the oblast, said Mr. Filatov. First, he said, is the primacy of continuing political dialog in an effort to reach consensus on major issues and to unify the population. Mr. Filatov will speak with representatives of any group that wishes to speak with him, even people who are mashugana (Yiddish [spelling varies]; crazy). Second, repression of people who were loyal to the Party of Regions (the party of Yanukhovych) will not be tolerated; these individuals were "hostages" to conditions beyond their control. Third, all action proceeds on the principles of complete territorial integrity of Ukraine and national authority of the central government in Kyiv. Fourth, guilty individuals, that is, those who committed violent acts against individuals or property will be pursued and punished. 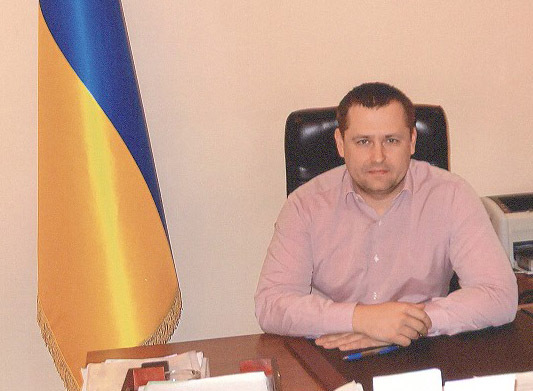 Boris Filatov is Deputy Governor of Dnipropetrovsk oblast and reports directly to the Governor, Jewish oligarch Ihor Kolo-moisky. Mr. Filatov was very outspoken during the interview, which occurred on April 4. A large Ukrainian flag stands next to his desk. In speaking with various interest groups, Mr. Filatov said, consensus has been reached on a number of different principles. All recognize that federalization and language primacy (Ukrainian or Russian) are explosive issues and, therefore, have agreed to postpone discussion on them until stability is restored to the country. All have agreed that military weapons and face masks will be removed from private persons. The different parties have agreed to abstain from insulting each other; specifically, they have agreed to abstain from mentioning Vladimir Lenin or Stepan Bandera in their speeches or on their websites; they have agreed to refrain from using symbols of extremist groups. They will not hold public demonstrations. Documents stating these principles have been signed (in both Ukrainian and Russian) by all interest groups, said Mr. Filatov. In order to discourage opponents of the agree-ments from attacking the signers for their "softness," the names of the signers have not been publicized. In addition to issues concerning Russia, Dnipropetrovsk oblast also is attempting to address certain basic domestic issues in the area. For example, said Mr. Filatov, it has established task forces on corruption, open business practices, and comparable matters. Everything now is "rotten," he stated. When asked if the writer could discuss his views publicly, Mr. Filatov responded affirmatively. Truth will be helpful to Ukraine, he said. Truth is essential in all "civilized" societies, he continued. He observed that Russia is broadcasting anti-Ukrainian propaganda to Israel and Germany, countries in which many Russian-speakers reside. Mr. Filatov expressed disappointment that the government of Israel had declined to express public support for Ukraine in the current situation, but said that he understands Israeli caution about antagonizing Russia. For discussion of the reasons behind the transfer of the Consulate from Dnipropetrovsk to Kharkiv, see the writer's most recent previous report Observations on Jewish Community Life in Ukraine - Report of a Visit in April 2013, page 100. Unlike JAFI, which charges a fee for its ulpans, the Nativ ulpans are free of charge; however, whereas JAFI ulpans include Jewish identity-building components, Nativ ulpans, fewer in number than their JAFI counterparts, do not. Nativ MASA programs are open to individuals with no prior Israel Culture Center association. See pages 44-45 about the Jewish Medical Center.